Rows of top-division European football kits hang from a giant goal net hooked to the ceiling, while two male developers kick a ball around on a green fake grass carpet. This isn't the most obvious place to be championing a more supportive environment for women during their periods. Indeed, Forza Football's chief executive Patrik Arnesson admits he "didn't think about the menstrual cycle at all" before a female employee asked if the firm could take part in a pilot scheme designed to break down taboos around menstruation. "No one had actually told me they had to leave work to go home because of PMS," he says. "And then I actually realized that this is a problem and I haven't even reflected on it." PMS, or premenstrual syndrome, is the name for the symptoms some women experience before their period which can include mood swings, feeling anxious or irritable and tiredness. Headaches or cramps ahead of or during menstruation are also common. But each person's symptoms are different and can vary from month to month. The project in Gothenburg is being led by a non-profit called Mensen (Menses) which was given a grant of 530,000 kronor ($58,400; £44,900) from the Swedish government's Gender Equality Agency at the end of last year. Klara Rydström, who is leading the project for Mensen, says that while Sweden has a global reputation for supporting women's rights, there is still a stigma around discussing menstruation in many workplaces. "But it's something we have to talk about, because it's a bodily function - a normal bodily function - just as being thirsty and you have to have water, or you're hungry and you have to have a lunch break," she argues. "I get really sad and lose all my self-confidence and self-esteem. It's kind of hard to do meetings where I need to be focused and positive," says software developer and project manager Lisa Hammarström. She says she's felt more relaxed talking about her symptoms since Forza Football started taking part in the Mensen project. Colleagues are happy for her to have a lighter workload when she's premenstrual, she says, because she's very productive during the rest of the month. "I realized that it makes things easier for me if people know what is going on and how it affects your work." Account manager Manolo Obaya admits that for some male staff, discussing periods in the workplace has been bit "awkward". "When (women are) hormonal, is that a justification for not delivering on work or whatever? It's hard to me to to say because I've never been in that position," he says, adding that he hopes the project will leave him better informed. "I think the value is just making everybody aware that some girls suffer more than others and that we should be trying to be understanding of that particular situation." The project didn't get off the ground, but the company says it is looking at other ways to spark more open discussions about menstruation. "The most important thing is that women do not feel we must be silent or ashamed about having our period," says the agency's cofounder Amanda Schulman. "We are actively working to ensure that women have the same rights as men, [but] this is not what reality looks like for many women who suffer from PMS, PMDD (a more severe form of PMS) or endometriosis. It is an important battle for us." Ivar Arpi, a columnist for Swedish daily Svenska Dagbladet - currently writing a book about gender ideology - argues that suggesting women might need special treatment dredges up old anti-feminist arguments that men and women aren't equal because "female bodies can't be trusted to work properly for the whole month". "Now you get a 'carte blanche' to act bad and you can blame your menstruation. That's really silly," he argues. "I don't think that my period is my boss's business frankly, and I think that in the workplace it's important to keep a professional atmosphere and not be too personal." 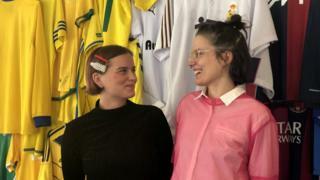 Josefin Eklund, who works in Forza Football's branding team, argues that even among educated women there can be a "real lack of knowledge" about PMS and PMDD. She herself struggled with severe headaches and fatigue that she didn't initially attribute to her menstrual cycle. "I was always taking two days off a month," she explains. "I started to schedule or write down how I was feeling to see if I could find a pattern and eventually I did. I could see it was related to my menstruation." "Menstruation will always exist, so it's better just to know how to deal with it instead of pretending that it's not going on." Mensen's Klara Rydström says she hopes the project will also encourage men to be more open about their health and wellbeing in the workplace too. "It opens up (discussions) for other issues as well related to men's bodies or the work environment in general. So I think it's very applicable to everyone."